I’ve been down in a sinkhole! Staring over the rather flimsy fence at the top, amazed and a tad nervous, we looked down, down at the layers of the world’s creation that were exposed in front of us like a giant Lasagne. Over the past few days we’d walked to the tops of hillside villages in the Dordogne region of France and admired the view from castle battlements. And now we were going to do the opposite, sinking 75 metres into the womb of Mother Earth. Known as The Devil’s Hole, (and it’s obvious why!) the Gouffre de Padirac wasn’t explored until midday on the 9th June, 1889, when Edouard-Alfred Martel let himself down on the end of a 75mt cable. Believe me, I wouldn’t do it! Now the site gets around 450,000 visitors a year. 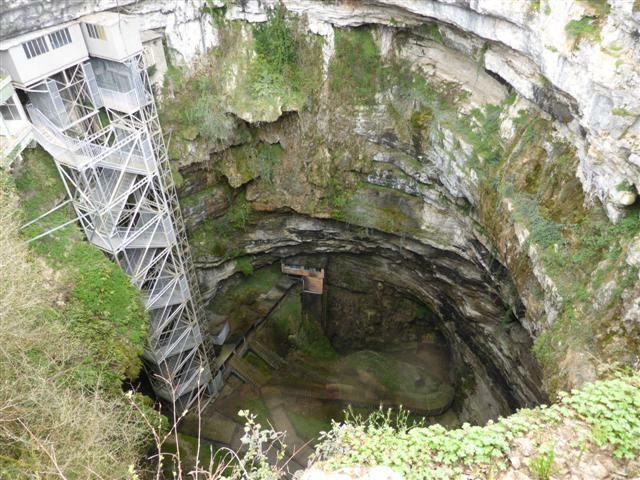 A sinkhole is caused by erosion, or the collapse of a cave roof, often in limestone. The Goffre de Padirac is almost perfectly circular. It must have made a deafening noise as it collapsed inwards. But there was probably no-one around to hear it. We had a bit of a nervous start as the lift doors closed, but the lift wouldn’t move. And then the doors wouldn’t open again. Dangling over the edge of the sinkhole, we listened to the guy outside trying to force the doors open. Finally they shot open and we all rushed out. Then we walked into another lift, slightly less enthusiastically, and began our descent. We could have walked down the 560 steps, but decided against it when we saw how far down they went, and voted to go in the lift after all! Stepping gratefully out of the lift, we inhaled the ancient, damp, musty, earthy atmosphere and stared upwards at the tiny view of the sky, way way above us. This was possibly how most of the Earth smelt when dinosaurs walked around and thick vegetation covered most of the world. One of our group burst into song, and the beautiful operatic air swirled and echoed upwards. It was a very moving, emotional moment. We were completely alone. A statue is perched up on a tiny hill. It’s called Tous Simplement, which means Everything Simply, or Whatever You Like. 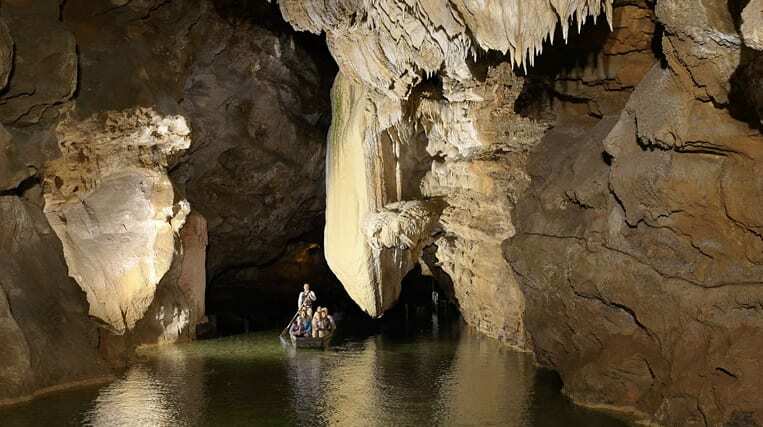 There are miles of unexplored caves honeycombed under the ground. We walked into the entrance at the bottom of the Gouffre, beside a river which runs down the rocky walls. It appears above ground, 20kms away, in the village of Montvalent. After walking for a while we climbed into boats and we were paddled along Rain Lake to another cave. When we alighted, we could hear the loud sound of water, then it hit us as we passed under shelters. It literally pours with rain – deep under the surface of the ground! The only life forms discovered in the water are a breed of white shrimps without eyes, and a type of small snail. Climbing up stone steps, we reached the Great Dome. 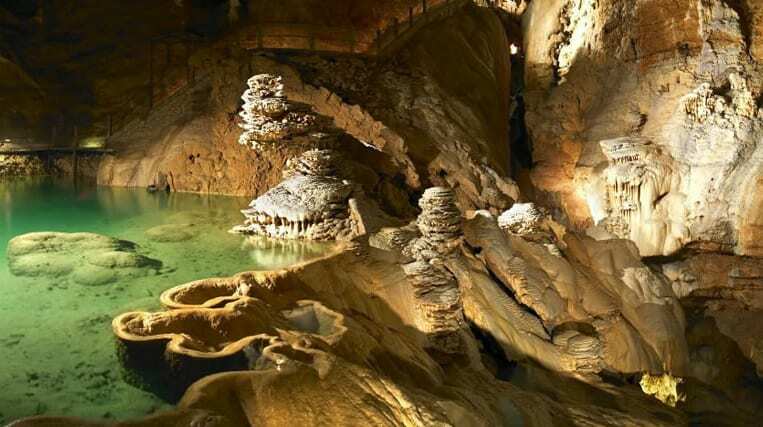 The ceiling of this magnificent underground natural Cathedral is 94mts high. On the way down we had a clear view of the Great Column, a stalagtite which is 75mts high! We floated back across the lake in complete silence, admiring Nature’s diverse designs, which have taken hundreds of thousands of years to form, and are still changing and growing. It makes you feel so humble when you see what’s been going on deep beneath our feet, long before Mankind stood up and walked around on the surface of this planet. And most of it is still undiscovered. 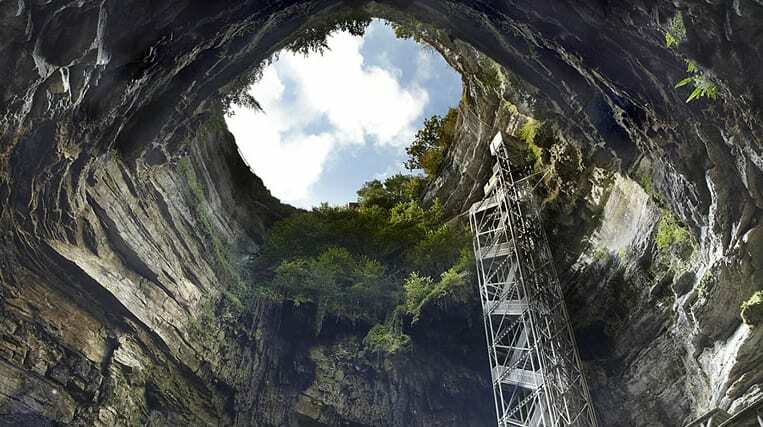 Speleology, the word describing the exploration of caves, was invented in 1890. 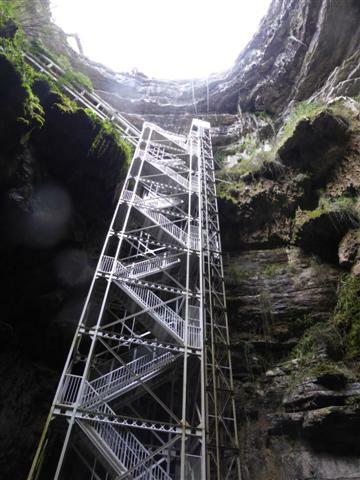 Enthusiastic Speleologists spend up to five days at a time under the ground, exploring the caves beneath the Goffre de Padirac. They have their meals there, swim in the lakes, and travel further and further into the depths of the Earth. Well good luck to them and they needn’t bother inviting me! I find caves fascinating, but I’ll stick to the well-known, brightly-lit routes, thank you very much!